The former farmers’ tavern Holzerhof high up opposite Cima del Tuono: typical high-up mountain farm in a sunny spot. 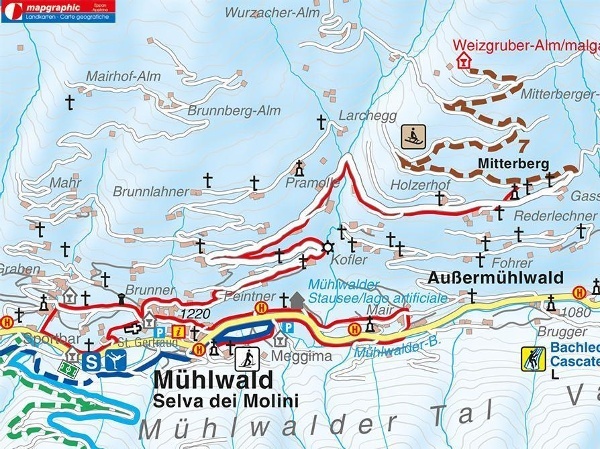 Tour starts in the church square in Selva dei Molini, follow the road up the mountain in a north-eastern direction (Pieterstein-Holzerhof), continue for approx. four kilometres: arrive at Holzerhof. No refreshments. 300 m elevation, walking time 2 hours. Outbound = return route. Accessible by bus from bus stop Selva dei Molini viillage. Refreshments in Selva dei Molini.